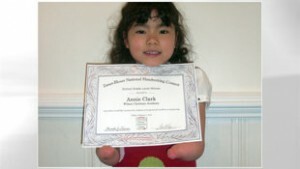 Annie Clark, a 7-year-old born without hands, upon winning a national award for penmanship. The first grader at Wilson Christian Academy in the Pittsburgh-area was awarded the Nicholas Maxim Special Award for Excellent Penmanship at a surprise assembly at her school Wednesday, where she was presented with a trophy and $1,000 prize from Zaner-Bloser, the textbook publishing company that sponsors the contest. After accepting the award, Annie demonstrated for the audience how she writes, gripping the pencil steadily between her forearms to perfect the letters and capitalization. According to Zaner-Bloser, 325,000 students entered its National Handwriting Contest this year.